Styled in a white finish, the Korg KDM-3 is a digital metronome with a classic look that resembles a miniature mechanical metronome. Great to help improve your rhythm and make your instrument practice consistent, it features eight metronome sounds (including cowbell, rim-shot, voice, and a mechanical metronome sound) and a sealed speaker enclosure, which delivers a clear tone easily heard over high-volume instruments. The KDM-3 offers 19 built-in beat patterns with 0 to 9 beats per measure and a choice of duplets, triplets, triplets omitting the middle note, quadruplets, and more. The tempo can be specified in the range of 30 to 252 BPM to accommodate a wide variety of musical genres. 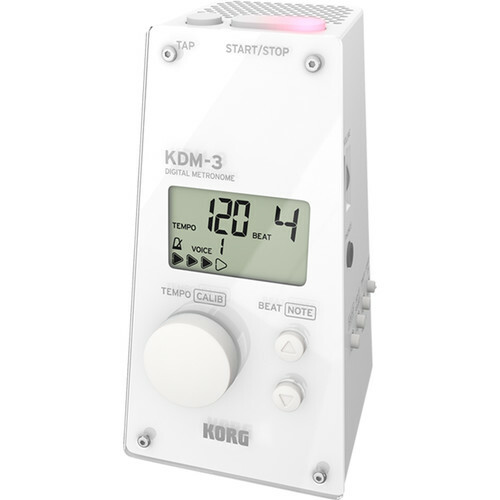 Packed with convenient features, the KDM-3 offers one-touch operation with a blinking Start/Stop button that provides a clear visual indication of the tempo, and an easily readable, large display that shows the settings at a glance. The Sound Out mode lets you tune your instrument while listening to a reference tone, while the Timer mode allows for the metronome to operate for a specified length of time and then automatically stop. Use the unit's Memory Backup function to preserve the specified tempo, beat, calibration, and reference tone, even when the power is turned off. The KDM-3 operates up to 120 hours on four fresh AAA batteries. Box Dimensions (LxWxH) 6.3 x 3.4 x 2.8"